Rahul Tripathi has led two distinct lives. The first, as an innovative software engineer, moving from India to Europe nearly twenty years ago. The second, as the vice president of product management for the largest software portfolio at Micro Focus, a multinational IT software organization headquartered in the United Kingdom with significant presence in the United States. Tripathi’s search for the answer brought him to business school. One conclusion he reached was that the difference was related to the importance of commercialization. “If you have not considered how a product will be commercialized or inserted into the market, then you may not see the impact,” he says. 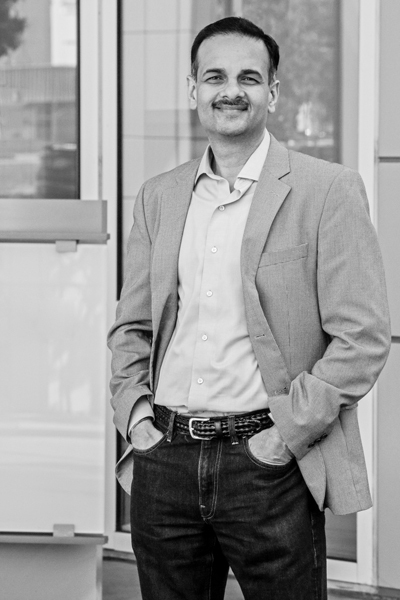 Thus began Tripathi’s second journey—this time into product management at Cisco Systems based in Silicon Valley—where he worked in the management software space. It was the first time he witnessed the interplay of engineering and business aspects in driving product success. As he further developed branch office applications, security products, and hybrid cloud solutions for Cisco, he learned firsthand what it took to build and grow a large business. Those lessons would help prepare him for his next mission in fostering a full business transformation. Two years ago, HPE Software announced its merger with the British software company Micro Focus, the same year Tripathi joined the company. The merger resulted in more than four decades of combined experience, billions of dollars in revenue, and one of the largest software technology firms in the world. In this environment, Tripathi took on the tall task of transforming a large part of the business and driving it into the future. First came the diagnosis. Tripathi and his team set out to understand all the customer pain points and issues. During their discovery process, they found that customer issues had little to do with software features or functions, and rather had everything to do with the offerings becoming too complex and difficult to use. For example, Micro Focus’s customers used their software to run large-scale IT infrastructure systems in banks, airlines, large consumer organizations, and other global businesses. The software enabled users to monitor their data center, run a service desk, or even manage HR issues. But customers would also have to deal with separate point products for each use case: server management, server monitoring, asset management, for example. “For any single use case, people had to put together four or five products and integrate themselves, or hire a more expensive professional services organization,” Tripathi explains. “By the time they found value, they had to write a multimillion-dollar check for the software and services.” On top of that, it might take a year to get up and running, and by that time the next update was already out. As it turned out, the pain points were not only on the consumer side, but internal as well. Engineers were experiencing challenges with maintaining the complex software with different groups building redundant functionality. Price books encompassed about 150 pages and over forty distinct products. There were also siloed functions for marketing, engineering, and product management based on internal structures not aligned to customer success. “As our product marketing leader explained to me, we spent more time explaining our products than selling them.” Tripathi says. Internal complexity was resulting in the loss of customers and potential business. Once the problems were identified, it was time to take action. “In my previous experiences, people believe you can’t drive a broad transformation,” he says. “Some believe you need to find a small project on the side and build from there. Another approach is experimenting with the latest processes and tools, like saying, ‘Let’s go agile; or let’s go to the cloud. That will take care of all our issues.’” Tripathi believes neither approach is successful. Tripathi and his team believed that the reason and goal for their transformation was to improve the life of the customer, and time-to-value (TTV) became an important metric to measure their execution against use cases defined in discovery phase. The plan incorporated three main dimensions: transformations in technology, process, and organization. For process transformation, Tripathi got active support from his engineering team, led by Maria Anhalt, Georg Hornung, and Bruno Labruere. The operations team, led by Felicia Lin, helped adopt modern DevOps practices, particularly Scaled Agile Methodology. Now, instead of delivering software every six to twelve months, which resulted in slow technology adoption, the team aimed to deliver every three months, and the development team was fully onboard. “Our engineers loved this,” Tripathi says. “They could plan more quickly, see the fruit of their labors, and make mistakes and fix them without delay.” In the end, there were fewer headaches, greater velocity, and a higher quality of features, he adds. Finally, in terms of organization, Tripathi and team carried on the transformation using mostly the same people onboard, which is typically uncharacteristic of many transformations. Instead of changing people, they changed the structures to align product managers, architects, developers, marketing, and sales people into smaller multidisciplinary teams mapped to customer use cases. The goal was extreme focus and alignment at the product level and consistency driven through process across the teams. Tripathi’s manager and champion of this transformation, Tom Goguen, was instrumental in aligning organizational structure and incentives to “favor the unknown vs. ineffective,” he says. The key was teamwork, or more specifically, finding a “coalition of the willing” and simply starting and executing, not waiting for buy-in from skeptics, he says. Tripathi’s team optimized forty-one products down to just six customer-focused products. Shorter development cycles led to greater feedback loops and faster updates, and above all, customer renewals and new purchases increased, leading to revenue growth and the best-performing business in the company. And in the end, while his “coalition of the willing” was necessary to start the transformation, contribution from each team member and support from leadership was necessary for successful execution. “We put together a system that served our teams, empowered individuals, and kept focus where it needed to be—on our customers,” Tripathi says. Capgemini is proud to partner with Micro Focus and Rahul Tripathi, through their transformation and product successes. Capgemini’s Engineering Services brings together deep domain and technical expertise to boost our clients’ competitiveness by unlocking the true potential of their product portfolios and software led differentiation. ONPOINT from Intact is a US-based, tool-agnostic, next-generation managed service designed to help you achieve sustainable results. Through a catalog of services from which to choose or interchange at any time, we dynamically adapt to changes and help you efficiently. Manage your software, Enhance your IT Management capabilities, and Optimize your investment.